I’m pretty pumped about island-hopping this weekend. I’m very curious to see how American Samoa is the same, which I hear it is, except with an American flavor rather than a Kiwi flavour, which I hear it has. Too bad I’m only there for 2 days. I try and keep the comment section organic, but occasionally I feel like I need to step in. When I wrote Monday’s blog, I worded it carefully to avoid comments about how I’m ka’a when it comes to learning the language. But one still showed up, similar to one in October, and so I felt the need to respond. Preparing for a standardized test is such an inexact science. My plan was to take a bunch of practice tests this week in order to prepare for the real thing on Saturday, but I was all fatigued after the one I took last night, so I think I’m going to take the night off tonight. But what do I do tomorrow? I was told Samoan youth were interested in Bebo, so when we were at the Internet last week, I had Marie sign up for an account. But now I hear Bebo is passé and Facebook is what everyone uses now. Bebo was never big in The States, but I get the feeling it’s like our version of Friendster. My fan is dying. Again. This is the one I thought died 3 days after I bought it when I first moved into my house. So that will be 2 dead fans in a year, putting fan life expectancy around 6 months. Sounds about right. My friend Chris bought his ticket to come visit in January. I should clean my house sometime before then. The Japansese haiku is defined as a poem of three lines with five syllables in the first line, seven syllables in the second line, and five syllables in the third line. English poets tend to ignore this fact. Disregarding syllable count, they generally call any three-line English poem with a “haiku feel” a haiku. This demonstrates that English poets have little respect for foreign traditions, even those from which some of their own poetry derives. Here’s a stupid story: I went to the Australian High Commission to drop off my passport to get my ETA visa, knowing full well there would be a 5-day waiting period, and knowing full well I was leaving for American Samoa in 3 days. What a moron. I’m sure the nice people at the Australian High Commission will give me back my passport tomorrow morning. My school secretary had a computer die on her at the end of last week, and then lost the replacement computer to a virus this week. I think the pattern is her. No more computers for you, Lau. Just kidding. I’ll run and get another one from my lab. Correction: The pictures and captions were inverted on Tuesday. I chose the background with the sky and grass. The boys wanted the wall. So Margarita actually liked my background better. The pictures and captions are now properly associated. Matt’s Samoa Blog regrets the error. That’s all I got. I hope you’re well. Pictures below. I walked behind this kid into town the other day. For like 3 blocks. 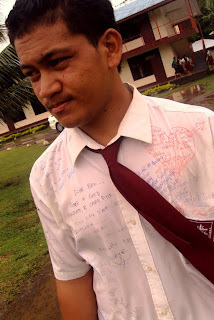 In the absence of yearbooks, students had their friends sign their shirts. Filifili displays his here. There were really long lines at the ATM on Wednesday. 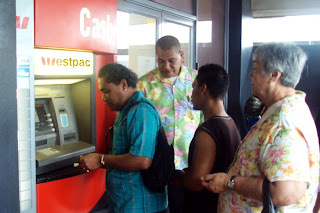 The man in the green shirt is actually a bank employee acting as the ATM attendant. He presses the buttons for users who are unclear on how to maneuver the interface. Good luck on the LSAT! I'm keeping my fingers crossed for you. 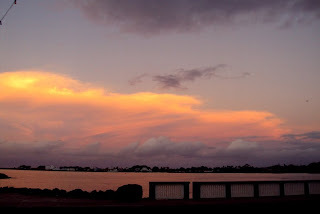 Try to enjoy the vacation around it- I took mine up in SLO, and I think getting out of town and hanging out with Jen and relaxing really helped. 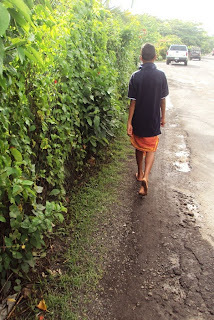 Like the picture of the kid you followed, he walked barefoot, kalofae ia na ia.